Yes, it turned out the winner was me. The jacket was in the parcel I picked up this morning. 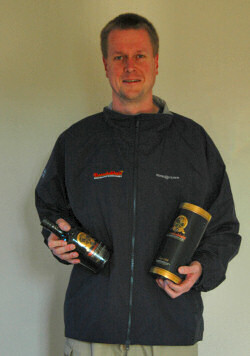 That's me in the picture, modelling the jacket and holding the appropriate bottle. The jacket it very nice, should come in quite handy with the autumn and winter approaching rapidly now as well as my upcoming visit to Islay at the end of October. PS: No, this isn't the first time I won something in a prize draw or raffle. I've won some chocolate (I think that's what it was, if my memory serves me right) in the raffle at the Islay Visitors Welcome Evening a few years ago. But I don't play the lottery.